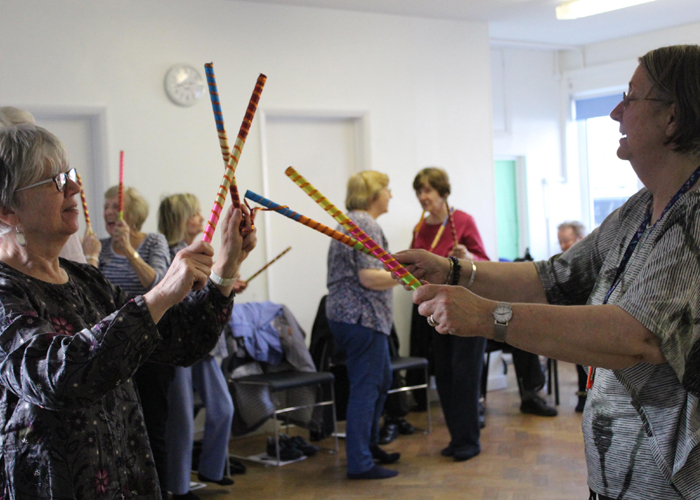 Dance Well Project Officer Claire Farmer writes about using South Asian dance to improve the physical and mental wellbeing of older people living with chronic conditions in an article for Art Professional. Dance Well is Akademi’s learning and participation project for older adults living with chronic health conditions and those with little or no access to physical activity. Dance Well workshops, inspired by South Asian dance styles such as Bharatanatyam, Kathak, Odissi and Bollywood, began in January 2016, taking place in community centres, care homes, hospitals and dementia day centres. There is a preconception that dance requires a large amount of space to have an impact, but we can provide creative movement at a patient’s bedside. To date we have delivered over 200 workshops to more than 900 older adults living with a range of health conditions. I manage the project alongside our project assistant, Pia Zicchi, who attends each workshop, greeting participants, gathering feedback and supporting the dance artist. The work itself is delivered by our core pool of learning and participation dance artists, many of whom also perform in our productions. When the sessions are completed the participants take home a booklet of South Asian dance-inspired exercises.